Although today’s walk was almost exclusively on quiet rural lanes, it had more of a feel of a Caminho compared to earlier days. We walked the first six kilometers leading the Belgians. The two couples from Australia and France were likely just out of sight in front of us. The trail was very easy to follow the entire way despite one comment mentioned below. More of the people along the way seem to realize that we are walking to Santiago and wish us well even if it is a “bom viage” rather than a “bom Caminho”. We even had a nice young guy pass us who is doing the Caminho by bike. Finally, we arrived in the pensão at 1pm so there is time to wash ourselves and our clothes, have lunch and see the town. All in all, a good day. Along the walk in Avelás de Caminho, we met a man from Braga who has to be in the Caminho Hall of Fame. If we understood him correctly, he was headed to Fatima, then finally walking home. Apparently, he has been away from home for quiet a while, during which time he walked to Rome, Lourdes and Santiago on the Via de la Plata route. He had all the credencials to prove it too. We gave him some money for a lunch and wished him well. 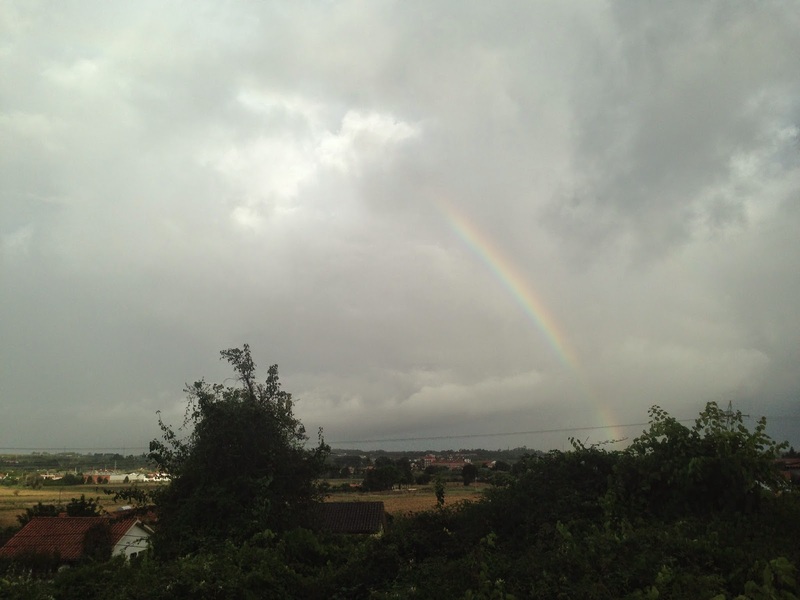 A short while later, I wondered if I had been conned but I don’t think so. He looked genuine but when we got to nearby Aguada de Baixo, we realized we were in the middle of the gypsy barrio of Portugal. Six different women were out walking their children up and down the street, first asking, then demanding money from us to feed their babies. After apologizing and continuing on, they cursed us and wished death upon us. Sweet things, these gypsies. When you see them, just keep walking. For those of you following, the only confusion was around Aguim at a single intersection. There was a pole with three yellow markings visible from quite a distance away. The top arrow told us clearly that we should soon turn left, then make an immediate right. That made sense as we could already see the dirt path through the woods that was the likely route. The middle sign had been painted over but appeared to say the same thing. The lowest sign also said to turn left but then not go straight, but make an immediate right. It was the same as the top sign but emphasized making that immediate right after the left. That’s clear, correct? But as you get closer, you will see our dilemma. Just where you are supposed to make that first left turn, there is a sign with a yellow X on it. Huh? Also, on the right side of the street, there is one of the official looking tiles telling us to continue straight down the tarmac road. What to do? We followed the road and there were signs that later turned us left. I suspect that the forest path just shortcut the L of the roads but possibly with muddy and hilly tracks. Choose your poison. 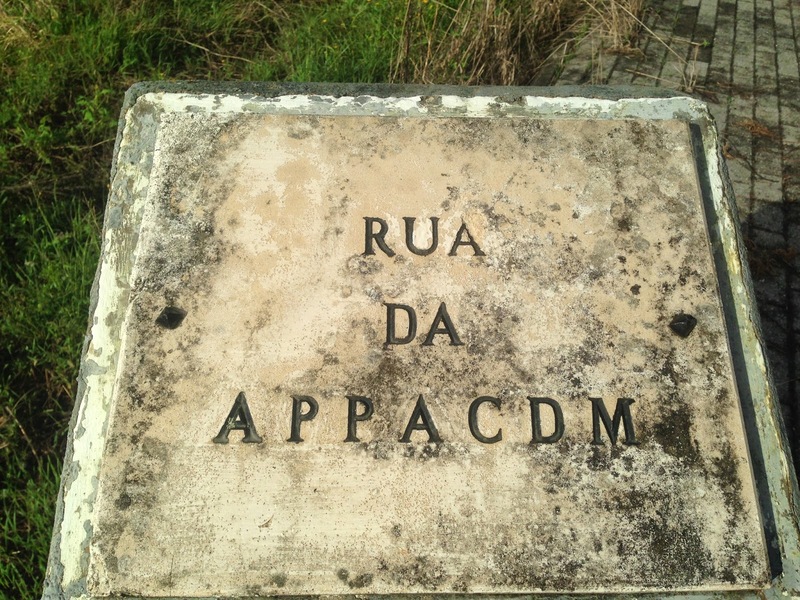 One last thing, when you arrive at Anadia, where the petrol station is on your left and a cemetery is across the street, the trail goes down the road on your left. The way markings there may be tough to find. 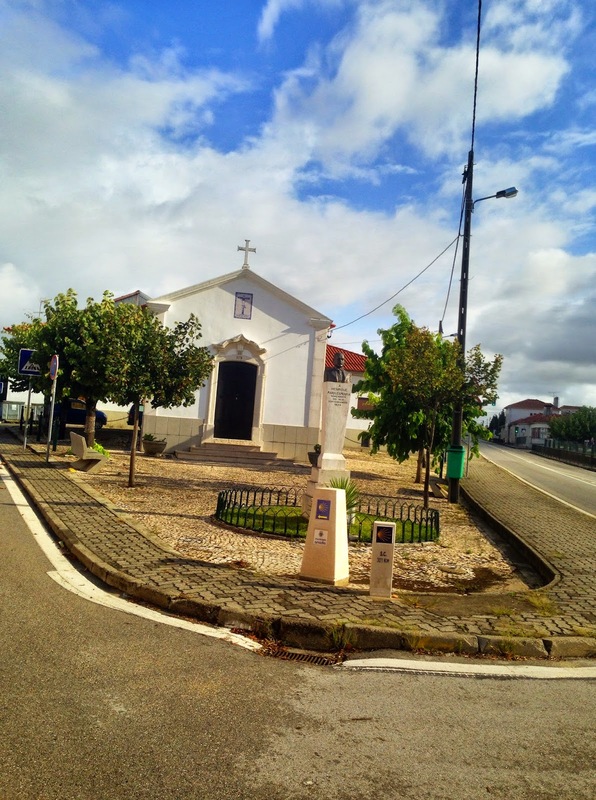 We are staying in the Pensão O Ribeirinho in Águeda, just a hundred meters to the right as you enter town over the bridge. It’s nice with a huge en-suite room for 35€. Those following may have heard it is closed but I can assure you that it is not. The albergue that I had heard was also closed is actually also open but about a kilometer out of town. I don’t think it is on the Caminho trail but I don’t know for certain. It is supposed to be nice and new with beds, wi-fi and maybe even some breakfast for 12€ per person but I am not sure that is worth the extra walk and isolation for the second day in a row. They probably have a much better area for washing and drying clothes up there though. Our bathroom floor is soaked from the washing and the bedroom now looks like Chinese laundry. Some random thoughts for the day involve bathrooms. First, when you pay only 30-35€ for a double room in Portugal, expect to get a special spa treatment after showering. You will exfoliate your skin with the towels they give you. In fact, you could also use the towels as sandpaper for various handyman jobs around the house. Second, I was in a café toilet yesterday when I finally figured out that Portugal is the source for the origin of the term “bowel movement”. Many of the cafés here save money on electricity by making sure the lights are not on when the toilet is not in use. They are equipped with motion detectors that turn the lights off after five seconds of no movement. How is that for pressure? By the way, I have discovered that I am not able to pee at the same time that I keep my rather long shirt urine-free and keep the lights on at the same time too. I tried waving my head instead of my hand but then I just wet the floor. I’m still thinking of a solution. One last memory was actually from a few days ago. We had seen the same thing in a few places that day and each time, it cracked us up. Imagine the farmer, driving his small tractor down the road. He is towing an even smaller trailer behind the tractor on which is standing his wife. She, in her typical Portuguese, matronly house apron, stands ramrod straight despite her frumpiness, holding onto a bar at the top of the trailer in front of her for support and balance. Naturally, we wave to everyone including these women and I swear, each one of them did a perfect imitation of Queen Elizabeth doing her royal wave back to us from a chariot. The Orioles clinched yesterday. Yee hah! Keep going Birds! If only we saw a sign “Vende Se”! 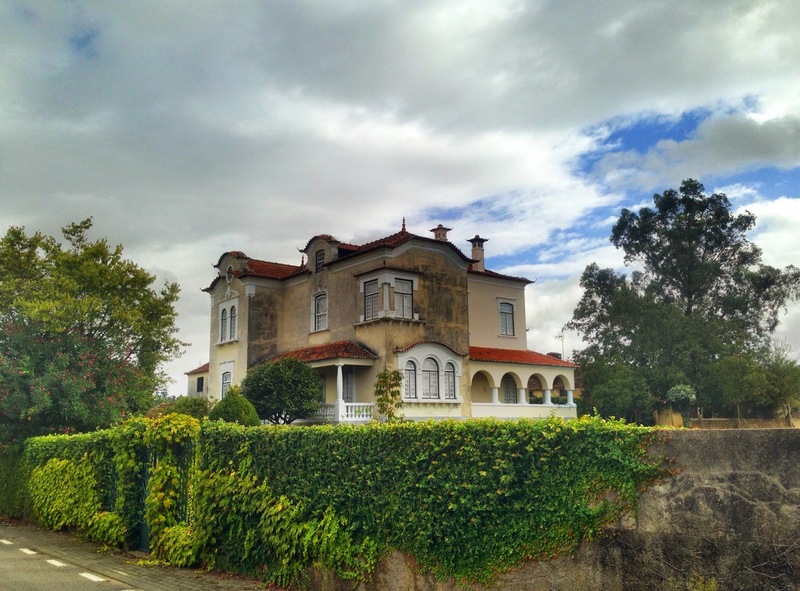 Lots of the beautiful old mansions line parts of the Caminho. They were built by expatriates who made their fortune in Brazil, Africa or the Far East and returned to show off their new wealth. 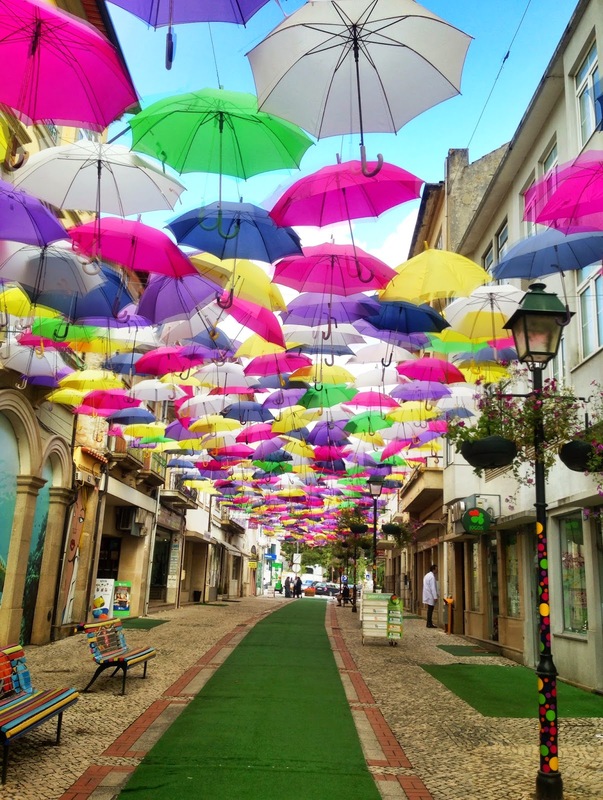 It must be the international festival of umbrellas in Águeda!